Recently I was asked if I could predict through Astrology what might happen financially in the coming year for someone without knowing much about the person, except by his birth chart. I prefer having a background of the person, but I was up to the challenge as I was only concerned with his financial health in the coming year. I kept my fingers crossed and was praying that the spirit of Morin would guide me through the interpretation and forecast for the coming year, as I was following his method in the delineation of the solar return chart. As I have said many times, Morin always felt one could not delineate the future without always referring back to the natal chart. If it is not promised in the natal chart, it can not happen in the solar return chart. To start with, one has to examine the ascendant and mid heaven and to see what houses they are in, in the natal chart, and to see if any planets are conjunct the angles and what houses they rule in the natal or solar return charts. 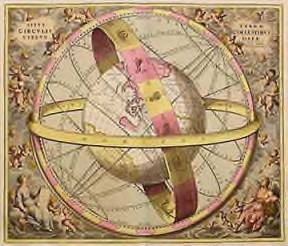 One then has to decide what planets are in the second house of the solar return with their aspects to the other planets, and the ruler of the cusp and its’ aspects. Then one must look across to the opposite house and see if it is occupied and what planet is the ruler of the eighth cusp. The solar return ascendant is Sagittarius and this sign occupies the seventh in the natal. 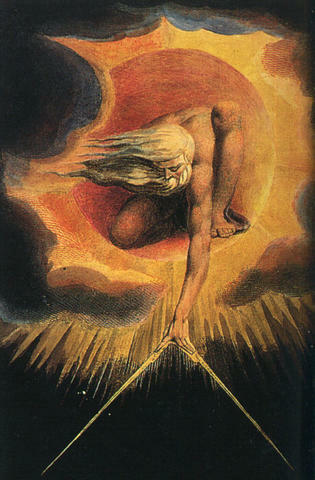 The mid heaven is the natal fifth, and is conjunct the natal Sun. In the second, the finance house is the North Node, Jupiter, Chiron, and Neptune with Saturn, the ruler of the cusp and trine the North Node. 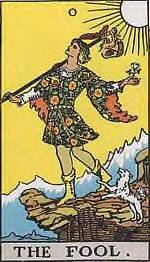 Looking across to the eighth house which is empty, the ruler is the Moon on the cusp of the twelfth, trine Mars on the cusp of the eighth. The following is my interpretation of what might happen to this person in the coming year. I have always felt, astrology indicates, but one still has the freedom to choose one’s destiny. With the seventh house cusp on the solar return first, the individual will realize in the coming year that to survive and thrive, his relationships are his allies, as he is theirs and the understanding of this, is his salvation. His ability to transform and transcend his relationships, career and his finances will be his saving grace at this point in his life. Although he may not realize it at the moment the whole theme for this year is living the good life and enjoying it like as in “La Dolce Vita” the movie, if any are old enough to remember it. 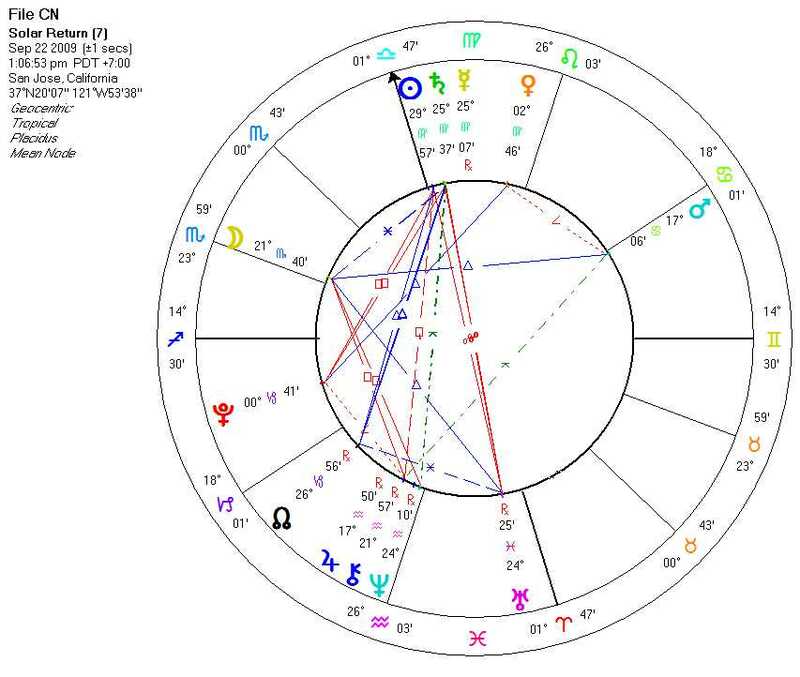 The Sun conjunct the mid heaven opposition Uranus near the fourth house indicates unanticipated changes in his career and possibly his place of abode or home life, whether it is his own making or outer circumstances demanding it. Although this may come as a shock outwardly to him, I think with the Moon squaring Neptune indicates confused feelings with self -deception in dealing with misguided attempts to deal with the loss of any kind. With the financial downturn it is obvious that the individual would be stressed with feelings of insecurity and emotional hyper-reactivity as indicated by the natal Moon squaring the solar return Moon. Another saving grace is that the Moon is trine Mars, giving him the passion, motivation, increased libido, energy and the desire to change a situation which is emotionally uncomfortable, but yet rewarding. With Mercury in the ninth house of higher ideas and travel, traveling will be a benefit to his soul and will give him ideas to keep and increase his financial security. The natal Moon is in the second house of finance showing the possibilities of fluctuations in his money and investments, but on the edge of Leo where he tries to stabilize and control the state of affairs. Natal Saturn is square the solar return Saturn creating feelings of frustration and the overburdening of one’s problems, and this becomes the turning point in changing his life direction. His need for the good life and his loved ones will help broaden his horizons and his ability to think out of the box, which is not his normal way of seeing things, but will be an asset for him this coming year. With the North Node trine the Sun and Saturn, and Jupiter in the finance and possession house, the finances appear to be in good shape, as Jupiter indicates a lump sum of money received during the year like a pension, severance pay or the selling of something that belongs to him. With the eighth house ruler, the Moon trines Mars, indicates the use of other people’s assets (his investments, 401 k, possible partnership or a loan) which will increase and fulfill his hopes and wishes. 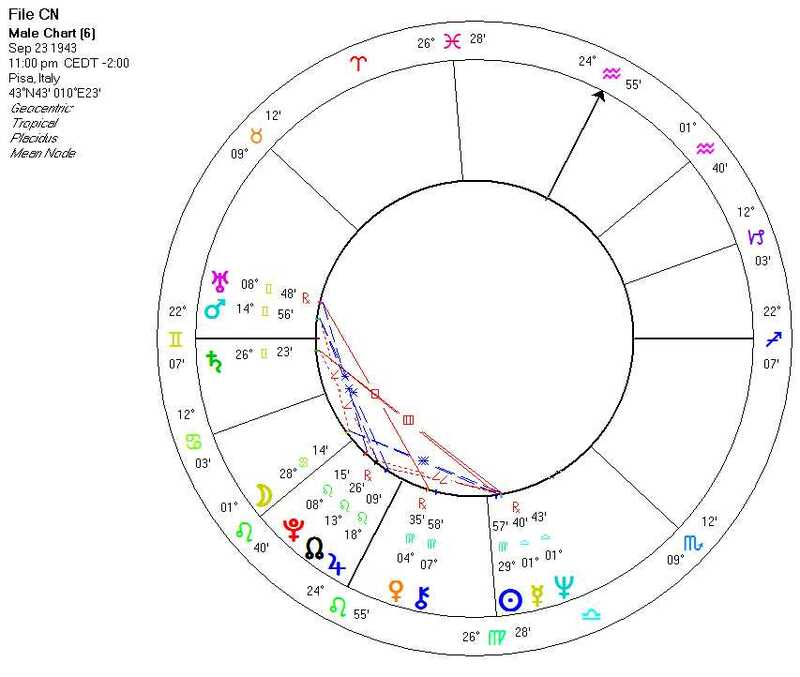 The problem is with Neptune and Chiron in the second and natal Jupiter squaring the solar return Jupiter, it brings lack of discipline, irrational exuberance, and overestimating the financial increase which might cause him to bite off more then he can handle. My final conclusion is that if he chooses and handles the situation properly, no matter how it may appear to him and is supposedly contrary to what he thinks he wants, and works with the flow without any illusions and deceptions, it will be financially rewarding and experiencing the good life as he sees it, a reality. In these times when everything seems not to appear to be on solid footing, like we thought it should be, the need to work towards a more secure foundation is essential. This is where Mars in the second solar return house is an important factor in building towards that financial security, but Mars can’t do it alone, since we don’t want to travel down the same financial melt down, we are now experiencing as a global society. What we as a society has learnt, or I hope we have learnt, is that we are all connected together and that if one falls, we all fall, eventually. It is the dominos effect happening to nations, states, cities and our local neighborhoods, and the “me first” needs to take a back seat, if we are to survive through to the better times. Mars is the Roman God of war who is full of energy and at times can be brash and insensitive to the needs and wants around him, and rushes into things without giving full attention to the situation. Mars in the Solar Return second house can indicate a self-initiated pay cut for many reasons that one hopes will benefit one in the long run, or cutting one’s hours to help the employer to stay abreast at this time. It could also indicate extra effort as incentives to bonuses at the end of year or when things begin their upturn, or indicate taking on another job to make ends meet or to save for something important. It also might indicate one becoming an entrepreneur while still working full time. Whatever the extra energy one is putting into it, Mars in the second solar return house indicates a need to be financially successful, independent and in control of one’s financial resources. 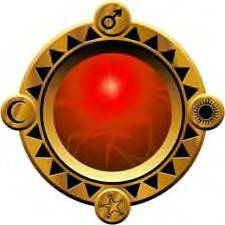 In traditional astrology Mars is considered a malefic and harmful in the chart, with aspects to a benefic, the harm may be less, but with another malefic, it could end up in chaos. Modern astrology doesn’t see it this way, but I was wondering and thinking how I could interpret and relate the harm in a modern sense. Mars can be brash and quick to judge, and will use action before thinking a situation out. To Mars, might is power and winning is the only solution to any problem. Seeing Mars in this light one can see the modern malefic at work. Just imagine what would happen if one became indignant and upset and felt that all the extra energy one was putting into it, was not appreciated by those one hopes would benefit from it. Or what would one think if one found out that the goals one were working towards for your family was not wanted by them? So to me if one acted on the indignation and upset, the outcome one was hoping for would not come about and the action considered malefic. To save modern Mars from the malefic traits of the past, the need to use Venus, Mercury and Jupiter to temper and guide the warrior Mars is a must. Venus gives us the ability to love others and see the beauty in everything. Mercury gives us the ability to think and to communicate with each other. Jupiter gives us the ability to care for ourselves and others and to work for the good for all, rather then just for the self. By working together, Mars malefic mischievous self can be understood and the harm it might do, be directed and become less harmful and actually be beneficial and helpful. As one continues to listen to the news about our economical recovery, one begins to wonder why a financial astrologer wasn’t appointed to the cabinet in the White House, as his predictions of the economy might have the same percentage of truth as some of the top economical advisors in the country have so far. Individual average citizens are suffering, listening to information that should be helping them to ascend from under their financial difficulties, but unfortunately, what they are hearing has no basis in reality. For those looking for jobs or trying to save their homes, the government has allowed the scams to continue to operate and to prey on those in desperate needs. When one is at one’s wits end, any desperate miracle sounds good, and the problem at these times is that our ability to think straight and clear, is impaired. I am beginning to realize, if we as individuals wish to survive this period of time and to enjoy a more prosperous era, we must begin to understand how the second house in our natal chart will reveal how we see our assets in relationship to how we really think of ourselves. Most people understand the second house to represent the finances, possessions, personal resources, our values, our skills to generate income and our ability to feel secure in our surroundings. It is also our physical voice, speech, singing and the presence that gives the command to the first house of “I Am” to the “I Have” in the second that allows all to know we are here to stay and to be heard and noticed. This house also plays host to the ability to use and make practical the knowledge learnt from the third house of communication and the ninth house of mental exploration into religion and philosophy. Remember, knowledge and the ability to use that knowledge is power. Knowledge is more powerful than all the money in the world and the mighty forces of any enemy’s army. Knowledge in the second has a strong survival instinct, and will use the assets and potentials of this house to become practical and useful for the individual and the world at-large. Knowledge is a possession and is comfortable, happy and productive in the second house. The first step in delineating the second house is to discover the sign on the cusp and its ruler, and if there is any planets in the house, and if not, if the opposite house has any planets that would reflect its influence in to the second. The sign itself will give an indication of how active it is and if it feels comfortable in this house. The next step is to see where the ruler, the planets in the second, and if no planets, the planets in the opposite house are, and to see how strong these planets are. Are these planets happy and strong, or are they weak? This will give one a good idea how well they will perform for you, and what kind of aspect are they forming with the other planets in the chart. This will let you know how your money will be earned, and will show you what assets will work for you. It is true that the tenth house will show you what field one would excel in and if one would achieve one’s goal, but the second will tell you in which way and how you will excel in it. Once you work with these keywords and the signs, more keywords will come to you, and you will begin to see what you need to provide the financial security in your life. In my own chart I have Libra on the cusp of the second with Aries on the eight without any planets in either house. With Venus ruler of Libra in the tenth house in Gemini and Mars ruler of Aries in the sixth in Pisces, which indicates although I would work in the arts that it was important how I use my mind, and that what ever career I would pursue, I would give it my all, with Mars in the sixth. Venus in the tenth also indicated that if my job wasn’t artsy, it needed to make me feel all was in equilibrium. Sometimes we don’t see the talents we really have because we are so critical of ourselves, but the second house will never lie about what you can really do when it comes to providing the foundation for growth. There are talents and assets lying dormant in thus house, we only need to recognize the potential and give them the chance to be used. I hope this will lead you to new adventures and to think out of the box when it comes to your financial security.